Take a morning from your time in Madrid to make an excursion to Toledo. 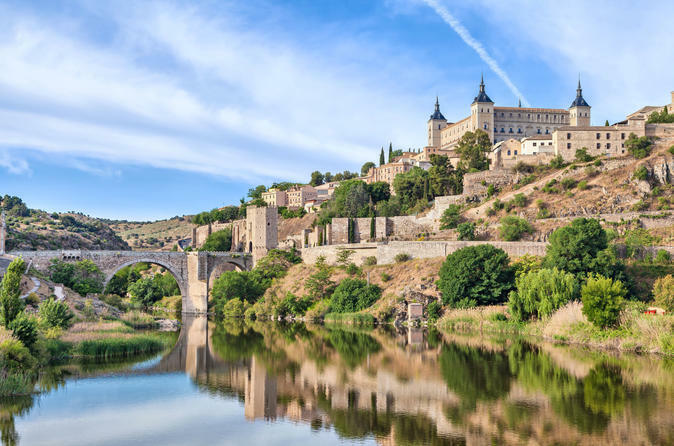 With this tour you will get all the information about the city of Toledo, its history and architecture from our expert guide and you will be back in Madrid for lunch so you can expend the rest of the day there. On this 5-hour excursion from Madrid, you’ll visit the city of Toledo, a UNESCO World Heritage Site. Your city tour begins with a panoramic visit to the Alcazar and the Cathedral. You’ll also get to see the Church of Santo Tomé, which houses a number of important sculptures. Explore the Jewish Quarter, characterized by its tangled maze of steep-sloping streets. You’ll have a chance to visit the Sinagoga de Santa María la Blanca, and get a panoramic view from Mirador del Valle. We will walk by the Monastery of San Juan de los Reyes. Afterwards, there will be some free time for you to discover the city’s lovely squares and gardens. You’ll undoubtedly learn a lot about the architecture, history, and culture of Toledo during your visit.